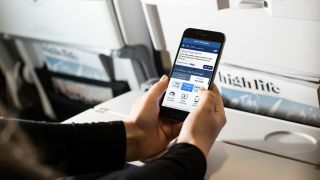 Well, it got there in the end – years after Wi-Fi started appearing on flights operated by US airlines, it's now officially coming to the British Airways fleet as well. You're going to have to be lucky to find it at the moment though, as it's only up and running on three planes. That number will rise to 118 long-haul aircraft over the next two years, BA says, so maybe don't delete your Netflix downloads just yet. Apparently passengers will get alerted to the presence of on-board Wi-Fi shortly after the flight gets underway, with two different plans available to buy. Stump up £4.99 (around $7/AU$9) for the Browse package and you get enough bandwidth to check your email and chat on WhatsApp. Upgrade to the £7.99 (around $11/AU$14) Stream package, and you'll be able to enjoy Netflix and YouTube while up in the air. Those prices are just for an hour of sweet, sweet Wi-Fi connectivity though – you'll have to fork out more cash for the four hour package or for the whole flight. For a limited period, Visa is sponsoring a scheme to give all passengers an hour of Wi-Fi for free, so maybe see how many movies you can download to your phone in that time. According to the FAQ page, you're looking at a minimum of 250Kbps for the Browse package and 1Mbps for the Stream package, so make your choice accordingly. Alternatively, just enjoy being unplugged from the grid for a few hours instead. Wi-Fi will be available once your flight reaches 10,000 feet, though any packages you buy are tied to the individual device you buy them on. BA says its short-haul flights will also get connectivity in the future, and the firm is hoping to have 90 percent of its planes with Wi-Fi on board by the time we get to 2019.